When Prahlaada was in the garbham of Leelaavati, his pita, Hiranyakashipa did a severe Tapas for Brahmadeva. Hence Leelaavati had the adrushtam of staying in the pivitra aashramam of Naarada maharshi. Due to the tapashshakti of Naarada, snakes-vultures, lions-elephants and other such animal pairs which have natural enemity, left their anger on one another and were co-existing in peace. Because of living in such an environment, Leelaavati used to always think about good and used to listen to the puraanams told by Naarada maharshi. One day, when Naarada maharshi was describing Shri Hari Leelas and greatness of Hari-bhakti, Leelaavati slept off, but Prahlaada who was in her garbham was listening a telling “ok” “ok” to all the tattvam that Naarada maharshi was telling. Thus even before Prahlaada was born he got Gnyaanopadesham from Naarada maharshi. On one shubha-lagnam, Prahlaada was born. Devatas showered pushpa-varsham. Brahmadeva, who was impressed by the severe Tapas of Hiranyakashipa, appeared before him and said “Vatsa! Your tapas is advitiiyam. Ask Me your abhiishtam and i will grant it”. Hiranyakashipa had duraasha. He believed this shariiram is shaashvatam and satisfying physical senses itself is aanandam. Hence he asked Brahmadeva “Svaami! I must have no maranam (death)”. Brahmadeva said “Kumaara! This is against Shrushti-niyamam. Ask any other varam”. Hiranyakashipa asked “Either on land, in water, in fire, in air, in aakaasham, by animals or humans or deva-daanavas or yaksha or kinnera or siddha or vidyaashara adi praanis, by any shastra-astras, during day or night I must never get maranam. Also I must always have vijayam in yuddham, I must get more power than Indra aadi loka-paalakas and be the King of Tribhuvanams”. Brahmadeva replied “Kashyapa-putra! no one ever asked such varams previously. But since you have done tapas and impressed Me, I am granting you this varam. But be a buddhi-sampanna and live”. 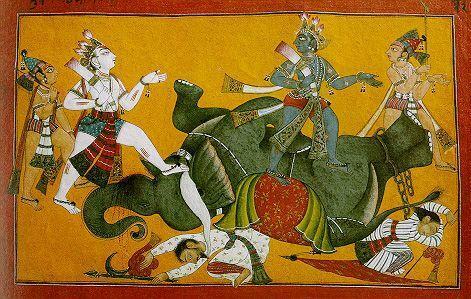 Hiranyakashipa tried to torture Prahlaada by throwing him down cliffs, getting him stamped by elephants, burning him in fire etc., but nothing happened to the great Hari bhakta. Prahlaada, who had only Shri Hari in his mind, never even thought about anything else. Hence Shri Hari saved him from the tortures of Hiranyakashipa. One day at Sandhya-samayam, fed up with Prahlaada saying Shri Hari is only Paramaatma, His bhakti is only shaashvatam, Hiranyakashipa said “where is your Hari? I even went to Vaikuntham and searched for him to kill him, but he was not there. There is no Hari. I am only Bhagavaan”. Prahlaada replied “Dont have the doubt that He is here, He is there. He is everyone. Wherever you search for Him with Bhakti, He will be there”. Then with anger Hiranyakashipa said “is it? If so, show Him to Me in this pillar”. Then Mahaavishnu appeared from the pillar in the form of Nara-simham, placed Hiranyakashipa in His lap, and teared him into pieces using His nakhas (nails). Thus even though Hiranyakashipa asked for a varam so that it was difficult to kill him, he forgot the fact that Paramaatma is more powerful and his duraasha, ahankaaram only lead to his downfall. A garbhavati’s other name is dauhrudi (one who has two hrudayams). According to our shaastras, whatever a garbhavati does has magnifying effects on the child. Hence our shaastras recommend, atleast during that period, listening to Harikathas, Puraanams etc. and always think good. Since Leelaavati did all these, her son Prahlaada became a great Hari-bhakata and a Dharmaatma. Duraasha always leads to difficulties (see Prataapabhaanu’s story). Hiranyakashipa, with his duraasha, believed this shariiram is shaashvatam and asked for a varam which no one else asked. Brahmadeva also said if he is good and has sadbuddhi then the varam will be of use. But having vara-garvam he tortured the worlds and himself became a reason for his end. The Bhakti of Prahlaada is ananyam. Though he was kid and his father tortured him so much, he never thought about anything other than Shri Hari. Hence Mahaavishnu saved him. Prahlaada comes first in the list of Bhaktas and is a maarga-darshi for us. Search Terms: Prahlada, Haranykasipa, Narada, Lilavati, Lilavathi, Leelavathi, Leelavati. Poundareeka was the Raaja of Karuusha desham. He always used to try to imitate Shri Krishna. He used to dress like Shri Krishna, wearing Piitaambaram, carrying Venu and Shikhi Pichchham (peacock’s feather) on the kiriitam (crown). He also got imitations of Sudarshana Chakram, Paanchajanya Shankam, Koumodaki Gada, Padmam, Shaarnga Dhanuh (bow). He also put a mark on his Vakshasthalam and said it is Kaustubham. Though he was doing all this, Shri Krishna, the Purushottama, never got Krodham. He thought may be atleast by imitating My outward appearance, his internal behaviour will change. But no. Poundareeka was no Bhakta to imitate outward appearance of Shri Krishna and change his buddhi. Infact, he started saying he is the “true Vaasudeva”, not Shri Krishna. He used to tell everybody, with Ahankaaram, that He is Paramaatma not Shri Krishna. Sarvagnya, Shri Krishna, even then didnt get any Krodham. He tolerated the duushanams of Poundareeka. However once with Garvam, Poundareeka went to the extent of imprisoning Parama Bhakta and sakha of Shri Krishna, Sudaama. Bhagavaan can tolerate anything but not His Bhaktas being tortured. He immediately reached Poundareeka, did his samhaaram and saved Sudaama, His priya-mitra. Once again God proved that He is a Bhakta-sulabha. Imitating, following Mahaapurushas is good, but following Them fully is very very difficult. Poundareeka could only imitate outward appearance but not the Dharma-buddhi of Shri Krishna. Ahankaaram is the root cause for one’s destruction. 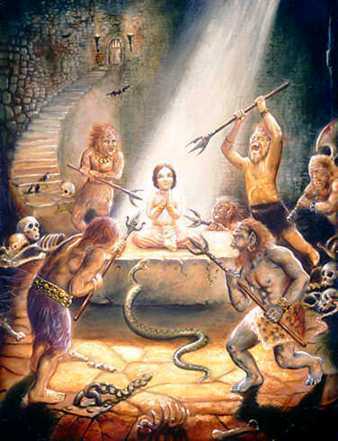 With Ahankaaram, Poundareeka thought he was only God, behaved like a Kruura and imprisoned Bhakta Sudaama. The greatness of a Bhakta is well shown in the story. Shri Krishna didnt get angry with Poundareeka until he tortured His bhakta, Sudaama. Nandana used to rule the Nishadha desham. The praja was very happy with the Raaja, who ruled them without deviating from the path of Dharmam. The Raaja used to do many Daanams to the poor. He used to do Anna-daanam to 1 lakh people everyday!! Once Naarada Maharshi heard the keerti of Nandana and came to test him. He said “Raaja! In the Trilokas, people are talking about your Dharma-gunam. Till now you were cooking the aahaaram in earthen pots right? Now use sand pots instead and your keerti will increase” and went away. After some days He came back. “Nandana Maharaja! I saw many who did Anna-daanam but none like you could cook in sand pots” said Naarada Maharshi. Then Nandana replied, with Garvam, “Naaradamuniindra! Only because of my Dharma-gunam, the sand pots are remaining intact without breaking. Not only this, I can do anything”. Naarada Maharshi went away with mandahaasam. This series of stories on Shri Krishna leelas try to bring out some durgunas, commonly found in people, and thus warn us to be away from the same. Along with Gopaalakas, Shri Krishna and Balaraamadeva approached the Rangasthalam arranged by Kamsa. Kuvalayapeeda (a Mada-Gajam, elephant) and its Gajaachaarya were ready to attack Shri Krishna-Balaraama near the Simhadvaaram. Seeing Balaraama-Krishna, the Hasti-paalaka directed Kuvalayapeeda to attack Them. Shri Krishna asked the Hasti-paalaka to give Them way to go in. However the Gajaachaarya didnt listen. 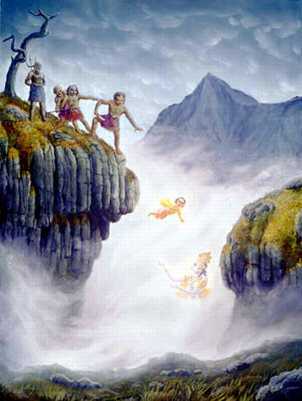 Shri Krishna then warned them that if they dont give way, they will go to Yamapuri. Still Gajaachaarya didnt stop Kuvalayapeeda. With its trunk, Kuvalayapeeda lifted Paramaatma into the air. Not able to bear His weight, it threw Him down. Shri Krishna then crawled under it and started playing Chatuh-stambha-Kriida (a famous game with 4 pillars). Because a Hasti has good Ghraana-shakti (sense of smell), it turned the way Paramaatma went during His Kriida (play). However it was not able to catch Him. Nanda-kishora then started to hang from its tail and swing. Kuvalayapeeda got tired. Paramaatma used to hit it once and run away then repeat and play like this. After playing for sometime like this, Parandhaama stood before it. It tried to stamp Him with its feet. When it tried to poke Him with its Dantam (tusks), Shri Krishna disappeared and hence Kuvalayapeeda’s Dantam got stuck in the ground. Paramaatma caught the Trunk of Kuvalayapeeda, who was rushing towards Him in anger, swirled and hit it against the ground! With aarta-naadam, Kuvalayapeeda died. 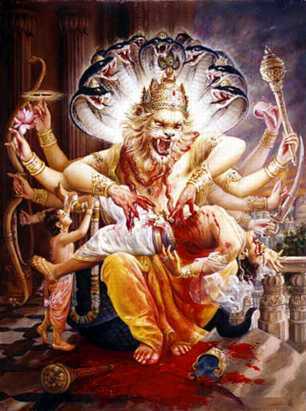 Paramaatma then pulled out one of its tusks and killed the dushta Gajaachaarya. Balaraama pulled out the other and a Divya-purusha came out from Kuvalayapeeda and became aikyam in Paramaatma. 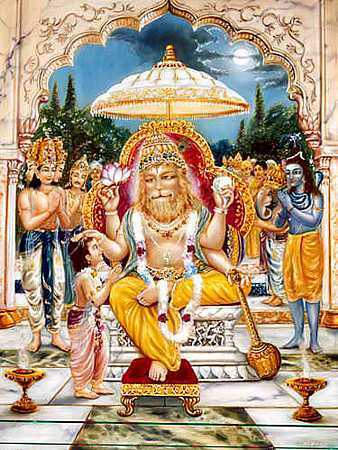 Mandagati was the putra of the great Vishnu-bhakta Bali Chakravarti. He learnt sakala-shaastras. He has great Balam; however had great Bala-garvam, Ahankaaram. Once he went to Shri Ranga Yaatra. He was like a huge Mada-gajam and started to walk without noticing the other Yaatrikas. Some Yaatrikas fell under his legs and lost their lives. Still, with Bala-garvam and Mada-unmattam, Mandagati continued his Yaatra. Tritunda, a Vruddha Maharshi, also fell under the feet of Mandagati. “During Shri Ranganaatha Utsavam you pushed me down. Become an asura with Gaja-ruupam” said Tritunda Maharshi. When Mandagati had pashchaattapam, Maharshi said “because of fighting with Paramaatma in Dvaapara-yugam, you will get Vimukti”. That Mandagati became Kuvalayapeeda, given by Devendra to Kamsa. Durgunam to be unlearnt: Bala-garvam, Ahankaaram. Ugraayudha, the Raaja of Ajaamiidha vamsham, was very famous. He was a balavanta. He even got the Chakraayudham from Shri Hari. However he then got Ahankaaram. With Bala-garvam, he used to unnecessarily do Yuddhams with other Kings. He stopped thinking about Dharmam-adharmam, Nyaayam-anyaayam, Saadhyam-asaadhyam. None used to stand before him in Yuddham. Many became his saamanta-raajas, others lost their lives in the Yuddham. This increased his Ahankaaram. Once he heard that Devavrata (Bheeshmaachaarya) was a Veeraadhiveera. He heard that in the Bhuu-mandalam, no one can defeat him. Ugraayudha then decided to do Yuddham against Gaangeya, so took a huge Sainyam and reached Hastinaapuram. “Bheeshma! There is no one who can defeat me. You also know this. You also know the power of the Chakraayudham. I dont want your Aishvaryam, Raajyam. I want Matsyagandhi, Bhuvanaika-sundari, Satyavatii Devi. I will give you one day time”. Bheeshmaachaarya became very angry listening to the Dur-bhaasha of the Dushta. He couldnt bear that someone spoke like this about his Maata, Pativrata, Satyavatii Devi. Immediately he ordered Yuddham against the Dushta, Ahankaari Ugraayudha. However, the Panditas, Purohitas, Nitya-hita-kaamas said “O Dharmaatma! Bheeshma! Ugraayudha is like a Pipiilakam (ant) before you. There is no need for you to go for Yuddham. Also your Pita’s Shraaddha-karma is not yet over. Shraddha is the most important thing in Pitru-kaaryas. You must not take Aayudhas, Divya-vastras now. Also one must always try to avoid Yuddham, because of its evil effects on the samaajam. Hence you send a Duuta, use Saama-daana-Bheda Upaayas and try. Then you can try Danda-upaayam. By that time the Pitru-kaaryam will also be over”. The Dharmagnya, Bheeshma, listened to the advise of the Panditas and sent a Duuta to Ugraayudha. However all the efforts of the Duutas went waste. The Durahankaari never listened to them. Infact he immediately used his Chakraayudham on Gaangeya. However even the Chakraayudham became nistejam because of the Paativratyam of Satyavatii Devi and Dharmabalam of Bheeshmaachaarya! The Chakram kept on spinning but didnt move an inch!! Ugraayudha used all his aatma-shakti, but the Chakraayudham never moved. Ugraayudha thought “Chakraayudham is more powerful than Brahmaastram. What is stopping it? May be because Bheeshma now has Aashouchakam, the Chakram is not approaching him. I will wait till the Aashouchakam is over”. However, even after the Pitrukarma was over, the Chakraayudham didnt move, it stayed in the same place in the air, spinning. Ugraayudha was amazed. In no time Bheeshma reached the place, along with his Anuja Vichitraveerya. In the hands of the Veera, Bheeshma, Ugraayudha lost his life. Seeing the Bala-paraakramam of Bheeshma, even the Devatas were surprised. All the people who were supressed in the Paalanam of Ugraayudha, then did Stuti of Bheeshmaachaarya. Ahankaaram destroys the person having it. One must always remember that there is always someone who is greater than us. Even though Ugraayudha got Shri Hari’s Chakram, just because of Ahankaaram, he was destroyed. A real Veera never shows off his Balam (see this too). Ugraayudha, with Bala-garvam, always did Yuddhams. Whereas Bheeshma, even though he had the Shakti to kill Ugraayudha, tried to send Shaanti-sandesham to Ugraayudha. One who wishes a Para-strii, that too a Pativrata, will be destroyed. Before the Paativratyam of Satyavatii Devi, and Dharmabalam of Bheeshma, even the Vishnu-chakram became equivalent to a grass-shoot! The amruta-vaakyas of the Panditas must always be remembered. Bheeshma followed the Dharmabodha of his Purohitas and was able to complete the Pitru-kaaryam and also teach Ugraayudha a lesson. Vyaasa Bhagavaan told Yudhishthira “Long time back, Jaajali maharshi used to do Tapas with Nishtha. Once, when he was immersed in Tapas, some birds built a nest on his Jataa-juutam (hair). Since Jaajali maharshi was a Dayaardra-hrudaya, he left the nest as it is! However, once he got Ahankaaram that no one can have more Dharma-nishtha than him. Aakaasha-vaani then said “There is a Vartaka by name Tulaadhaara. He has more Dharma-nishtha than you. However he never has Garvam”. Jaajali maharshi got asuuya and wanted to see the greatness of Tulaadhaara. On seeing the great maharshi, Tulaadhaara welcomed and said “Maharshi! Please come. You are a Dayaa-saagara. You even let the birds build their nest on your Jataa. You are very great”. Jaajali maharshi was surprised and asked “how do you know about me?”. Tulaadhaara replied “Arya! Why will I leave my Sva-dharmam? Anyway let us ask these birds what is Dharmam”. Birds flew and said “We are the sevakas of Dharma-devata. On Yamadharmaraaja’s aagnya, we came to test you both. Ahankaaram and matsaram destroy everything. Hence one must not have them. Tapas and Yagnyas done without chitta-shuddhi and shraddha are not good. Through Shraddha all good things happen”. Saying this, the birds flew away. Vyaasa Bhagavaan continued “Yudhishthira! So Bhaarateeya-saampradaayam is great. Hence it suggested Yagnyas, which are the act of showing Krutagnyata. One must follow our aachaaram and through aachaaram only Dharmam is got. We must do Karma, but without expecting anything in return (Nishkaama-karma)”. The Daya gunam of Jaajali maharshi is great. He left the birds, who built their nest in his head, as it is taking pity on them. Ahankaaram is the first step for destruction. Hence one must never have Ahankaaram, Garvam, Darpam. As shown in the story, there will always be a person greater than us. The importance of Sva-dharmam is well shown in the story. Though Tulaadhaara didnt have any Dhana-kaanksha, he didnt leave Vartakam (bussiness). Bhaarateeyas believe in Nishkaama-karma. They do their Kartavyam, Sva-dharmam, without expecting anything in return. As told in the story, whatever Yagnyas etc., Bhaarateeyas do, are only to show Krutagnyata for the things they already got, than expecting things in return. Kaartaveeryaajuna was the Raaja of Mahishmatii-nagaram. With Tapobalam, he got 1000 Baahu (hands) and was doing Raajya-paalana with Bala-darpam. Once Raavana, on the way of returning from a Vijaya-yaatra, came to Narmadaa-nadii-teeram. It was time for Madhyaahnika-Sandhyaavandanam. After taking snaanam in the nadi and doing Sandhyaavandanam, since he always did shat-kaala-Shiva-pooja (6 times Shiva pooja per day), he started doing abhishekam to the Svarna-lingam, which he always carried with him. With his 20 baahu (hands) he did Shiva-pooja, doing Veda-paaraayana with his 10 mouths. With great Bhakti he did Shiva-pooja, in accordance with Shaastras. Suddenly Narmadaa, reversed its direction of flow and washed his pooja materials away! He came to know that 0.5 Yojanam away, Sahasra-baahu (Kaartaveeryaajuna), was doing Jala-kreeda with thousands of women, stopping the flow of Narmadaa with his hands! Then Raavana with anger went to fight with Kaartaveeryaajuna. There was a fierce Yuddham between the two. Like two Suuryas, two Mada-gajas, they fought each other. Finally Kaartaveeryaajuna won over Raavana and put him in prison. Seeing this all the Devatas, maharshis were happy. Everybody was taking about this episode only. They were surprised to see the mahaa-balavanta Raavana being defeated. The whole of Svarga-lokam was echoing with the story of the Shakti and Veeratvam of Kaartaveeryaajuna. Pulastya Brahma, the grand father (pitaa-maha) of Raavana, also heard this. He immediately went to Kaartaveeryaajuna. Kaartaveeryaajuna said “Mahaanubhaava! I am dhanya to have got your Darshanam. Please tell me what I need to do. I and my people are ready to do what you order”. Pulastya Brahma replied “O Raaja! I am happy with your Bhakti and Shakti. You got the name ‘Raavana Vijeta’. Now leave my pautra (grandson)”. Immediately Kaartaveeryaajuna left Raavana, after doing satkaaram to him and agni-saakshi mitratvam with him. Later, only because of his bala-garvam, Kaartaveeryaajuna fought with Parashuraama, the avataar of Mahaavishnu. Kaartaveeryaajuna was killed in the Yuddham!! Aha! There is always someone who is greater than oneself. Hence we must never have garvam, darpam. After Shri Raama’s Divya-leela of Shiva-dhanurbhanjanam and Sitaa-Kalyaanam, Parashuraama comes and asks Shri Raama to take the Vishnu-dhanuh, if He really has shakti and knows Dhanurvidya. Just on the very touch of Shri Raama of the Vishnu-dhanuh, all the Bhagavat-shakti of Parashuraama enters Shri Raama. Parashuraama realizes that Shri Raama is Paramaatma Himself, does stotram of Shri Raama and leaves the place. One nice example of showing knowledge of Shri Raama on Dharnurveda is this story. Raavana who defeated all Devatas, Dik-paalakas, his brother Kubera and the Yakshas, was easily defeated by Kaartaveeryaajuna. The bala-garvam of Kaartaveeryaajuna was removed by Parashuraama. Then a baalaka, of just 16 years, Shri Raama, not even by using the Vishnu-dhanuh, just by touching it, did Garva-bhangam of Parashuraama! Thus Shri Raama did avataara-anusandhaanam and Yuga-anusandhaanam with this Leela. Using the dhanuh and winning a Yuddham is the act of ordinary Veeras and Shuuras. Just by doing anusandhaanam of Shiva-dhanuh, Shri Raama broke the Shiva-dhanuh! And just while taking the Vishnu-dhanuh from Parashuraama, He won over Parashuraama. Thus Shri Raama is known as “Dhanurvedecha Nishchitah”. Even though Shri Raama had so much Shakti, Balam and knew all Shastra-astras, He always had Vinayam and never left Dharma-maargam. Whereas Raavana even though had such alpa-shakti (when compared to Shri Raama), had a lot of Ahankaaram. A person who does Vidyaa-daanam to a satpaatra (deserved one), is considered to be a Shreshtha. Because of such a Vidyaa-daata, 100 Vamshams will be saved. Of the daatas a Vidyaa-pradaata is like Mahaavishnu in Devatas, Shri Mahaalakshmi in strii-jaati. In the previous Kalpam, there used to be a braahmana by name “Sangira”. He used to do dustarkam with Panditas. Though he didnt have enough gnyaanam he used to have durahankaaram that he was a Gnyaani. He was a Hetuvaadi. He never thought about paramaartham and always tried to do dustarkam and show his greatness. He used to do Veda-ninda! He used to say Vedas were written by humans!! Similarly Smrutis. He also used to do Puraana-ninda and Itihaasa-parihaasam. Without Lajja and Bhayam he used to take wrong meanings of Sadvishayams and do their duushana. Panditas used to close their ears unable to bear the words of this fellow. In those days, the shiksha for such people was Desha-bahishkaaram, since if he is left, he will spoil the others too. Thus Sangira was pushed out of Bhaarata-desham. Sangira reached Mleccha-desham. There also he continued his Kutarkam and finally vidhivashah died there only. Reaching Yamalokam, crossing the Vaitaranii-nadi, itself was difficult for this paapi. Finally he reached Yamalokam. Yamadharmaraaja, the Samavarti, ordered that he must experience all the shikshas that were there, since there is no paapa-kaaryam which he didnt do! The klesham Sangira experienced in Naarakam is undescribable. There was no end to these shikshas. Howmuch ever the Yama-kinkaras tortured, Sangira’s paapam was not decreasing. Even the others in the Narakam used to say “he is a mahaa-paapi” (because he was experiencing many new shikshas which they never experienced). Once, Shataananda, the putra of Gautama maharshi and Ahalyaa Devi, and the Purohita of Janaka maharaja, came there. Being a Dayaardra-hrudaya, he was not able to see the difficulties of the people in the Narakam. He also saw Sangira, due to the small Punyam Sangira did. Shataananda then did bodha of Shiva-vidya to the people in the Narakam. Just because of Shiva-vidyaa-shravanam, Narakalokam became Naakalokam (Svargam)!! Sangira did pranaamam to Shataananda, the Shiva-vidyaa-pradaata and became a Punyaatma. Aatma-vidyaa-daana phalitam cannot be counted (Sankhyaatiitam)! Brahma-vidyaa-daanam gives phalam of doing all daanams!! Vidyaa-daana-phalam is got by following things too: an Upaadhyaaya who makes Vidyaarthis study well, giving Anna-daanam or Vastra-daanam to Vidyaarthis, Grantha-daanam to a satpaatra, organizing puraana-pravachanams by Panditas etc. The greatness of Vidyaa-daanam is well shown in the story. Even a Mahaapaapi like Sangira can be saved by doing Vidyaa-bodha. Veda, Puraana, Itihaasa duushanam is a Mahaapaapam. We must be very careful to be away from these. Ahankaaram is the root cause of everything. Due to the Ahankaaram of being a Pandita, Sangira tried to de Kutarkam and show his greatness. Hence we must always have Vinayam. Once upon a time, there used to live a sadbraahmana by name Sunandana in Meghankaram. He was a Saaranga-paani Bhakta (Paramashiva bhakta). He used to do archana of Parama Shiva, who was in the form of Saaranga-paani in Meghankaram. Sunandana was a Pandita, Veda-vedaanga nipuna and a Shuddha Brahmachaari. Hence was doing Nitya paaraayana of the 11th Adhyaayam of Shri Bhagavat-gita. Once he went on a Teertha-yaatra to Kaantaasthali. It is the pavitra-kshetram where there prasiddha-aalayam of Shri Mahaalakshmi. A guide showed Sunandana the pavitra-kshetram and many siddha-pradeshams in it. He also told that the Nadi-jalam is very sweet and the people are good. However he advised Sunandana not to stay for the night and he added that even if he wanted, the villagers will not allow him to stay in the graama-satram. Sunandana didnt understand why and requested the graama-adhikaari to grant him permission to stay in the satram. Finally Sunandana managed to convince the adhikaari. The adhikaari said “may be you are the person” and unwillingly gave his permission. Sunandana slept in the satram for that night and as usual woke up the next day before Suuryodayam. Bhimamukha was an ordinary Karshaka. Once when he was involved in doing his work in the fields near the satram, a Vruddha came there. Unfortunately, a vulture sees the Vruddha, who was not even having enough strength to walk, and attacks him. However Bhimamukha, being capable of saving the Vruddha, doesnt help him, because of being involved in his farming. Seeing this, a Sanyaasi who was passing near-by wanted to teach Bhimamukha a lesson so that no one will repeat such mistakes. He gives Bhimamukha a shaapam that he will become a raakshasa and a Nara-bhakshaka! The shaapam of Bhimamukha turned out to be a shaapam for the villagers instead, because Bhimamukha was eating away the villagers one-by-one. All the villagers then ask the Sanyaasi for Sharanam. Sanyaasi gives abhayam and says that Bhimamukha will not cross the satram’s boundary and will only eat people who stay there in the night. Also when a Gnyaani who really has knowledge about Bhagavat-vishvaruupam comes, Bhimamukha will get vimukti. Listening to this, Sunandana gives Vimukti to Bhimamukha and when aksed by Bhimamukha how he got so much Gnyaanam about Bhagavat-vishvaruupam, tells like this: “I used to do paaraayana of 11th Adhyaayam of Bhagavat-gita. Because of that I have gained this Gnyaanam. However since a perfect Brahmachaari, a Veda-vedaanga-tattvagnya and a Shiva-bhakta can only read it, ordinary people can do the smarana of ‘Sthavishthah’ naamam in Vishnu-sahasra-naamam instead and get the same phalam”. Thus knowing the greatness of Vishnu-sahasra-naamam and in particular, the naamam of ‘sthavishthah’, the villagers and Bhimamukha do Naama-paarayana and get ananta-phalam. We must always do paropakaaram. Being capable of saving the Vruddha, Bhimamukha, being involved in his work, didnt save him. As told by this Sanyaasi, this is very bad. The greatness of Vishnu Sahasra naamam is well shown in the story. It is our adrushtam, that Bheeshma-aachraya and Veda Vyaasa gave us this ananta-nidhi. Especially in Kaliyugam Naama-sankeertanam is the easiest way for Mukti. Paramaatma does shrushti, sthiti, layam of this Brahmaandam. An example of this, Shri Krishna Paramaatma Himself showed us — He only created Dwaaraka, protected it and finally destroyed it. Dwaavarka-vaasi praja, Yaadavas saw very closely Shri Krishna protecting them everytime they were in trouble (see Krishna leela stories). God protects somebody expecting that in turn he will protect somebody else and do paropakaaram (see this too). But Yaadavas got Garvam that always Shri Krishna will protect them! Aaha! even great people who had the adrushtam of being in the company of Shri Krishna had to finally succumb to Ahankaaram. So we being normal people must be more careful and always have Vinayam. Once, Shri Vishvaamitra maharshi, Shri Vasishtha maharshi, Shri Kanva maharshi, Shri Bhrugu maharshi, Shri Duurvaasa maharshi, Shri Angiirasa maharshi, Shri Kashyapa maharshi, Shri Vaamadeva maharshi, Shri Atri maharshi and Shri Naarada maharshi came to Pindaaraka-kshetram. Instead of respecting,doing seva of these maharshis, Yaadavas make Saamba, the Jaambavati-putra, dress like a pregnant woman. They take Saamba near the maharshis and ask Them to bless the woman with a good child. Seeing that the Yaadavas were making fun of Sajjanas, who need to be respected, to teach them a lesson, They give a shaapam that Saamba will give birth to a ‘musalam’. And because of it only the Yaadava vasham entirely will perish. Exactly as the maharshis said, Samba gave birth to a ‘musalam’. Seeing the anarthas that may come, Yaadavas try to melt the ‘musalam’ — however they leave one piece which Jaara, an aatavika, picks and uses as the sharp edge of his arrow. From the other remains of the ‘musalam’ sharp grass plants grow. Once Yaadavas take a Maadaka-dravyam by name “Maireyakam”. Driven by it, they start fighting amongst each other. Finally they pick up the sharp grass, grown by the remains of the ‘musalam’, and kill each other! Like this everyone dies in the petty fight. Though they were Vivekas, had many Sadgunams, and were close relatives to Shri Krishna, in the effect of the Maadaka-dravyam, they kill each other in the petty quarrel. Seeing this, with Vairaagyam, Balaraamadeva, the avataar of Mahaavishnu, leaves His shariiram and goes to Vaikuntham. Jaara, thinking that a deer is hiding behind the bushes, shoots Shri Krishna’s leg, with the arrow whose end was made with the ‘musalam’. Shri Krishna also then leaves to Vaikuntham. Finally, the apuurva Dwaaraka Nagaram always gets submerged in water. Ahankaaram is very dangerous. We must be very very careful to be away from it. As we saw in the story, it doesnt even spare great people like the Yaadavas. Respecting elders and the Sajjanas is very important. Yaadavas, instead of doing seva of the great Maharshis, made fun of them. This only lead to their destruction. Taking drugs (Maadaka-dravyam), or Suraapaanam, make a person loose his thinking capability. People in their effect can do any paapa-kaaryam. Due to the effect of Maireyakam, the Yaadavas, who are otherwise Vivekas and Veeras, fought against each other and killed themselves.